With the junior varsity cross country team running at the UCCS Rust Buster and varsity racing at the Lake County Invitational in Leadville, the Cougars have a crazy week full of achievement. Ben Swanson approaches from behind in the last 50 meters of the race to beat DeLaCerda of Alamosa. It was a hectic two days for the cross country team last week with the junior varsity team running at the UCCS Rust Buster on 9/1 and the varsity team heading up to the Lake County Invitational in Leadville on 9/2. Both teams ran well despite the relentless heat, the elevation, and the intense allergies afflicting many Cougars. The cross country team displayed many exceptional performances even with the various injuries and sickness circulating the team. The UCCS Rust Buster at downtown Colorado Springs’ Monument Valley Park brought a unique experience to the Cougars; it is one of the few meets the team attends that hosts not only high school but college and middle school athletes.The course was a 4k instead of a 5k, and long-time coach, Doug.Hugill, who recently retired, was working as the race D.J., bringing excitement to the meet. With the change in distance, it was important for the team to understand the differences for the purpose of pacing throughout the race and comparing times. A four kilometer race is equal to about 2.5 miles while a five kilometer race being 3.1 miles; that is more than a half mile difference which led to a change in race strategy and time. With the girl’s open race kicking off in the early afternoon, the temperatures soared, but our ladies still put on an impressive fight to the finish. Leading the junior varsity team this week was sophomore Alison Ambuul running an 18:14.50 4k. On the boy’s side, the first cougar home was sophomore Corbin Littau with a 15:23.60 4k. At the Rust Buster, Coronado cross country took advantage of the flat, fast course, and many showed major improvements from the beginning of the season. The next morning, the Cougars set their alarms early and headed up Ute pass for an early morning race in Leadville. Going up to 10,200 feet and racing on one of the hilliest courses in Colorado definitely awoke the Cougars’ nerves, but the team pulled through and proved to everyone why they drove over two hours to get there. With half the course being uphill with half the oxygen to take in, times were slower than last week but still impressive. The lady Cougars hit the hills first, running only four varsity members, junior Maddy Morland coming in as the team’s first finisher. Next up, and yes, literally up the hill, were the male runners with Conor Strizich,12, and Ben Swanson, 11, the first Cougars to finish. With half a mile left in the race, both boys were nowhere near 1st place, but with a killer kick, both improved their placing. Conor Strizich, senior, came in 4th place overall, while Ben Swanson, out sprinting everyone, won the grueling meet with a time of 18:25. 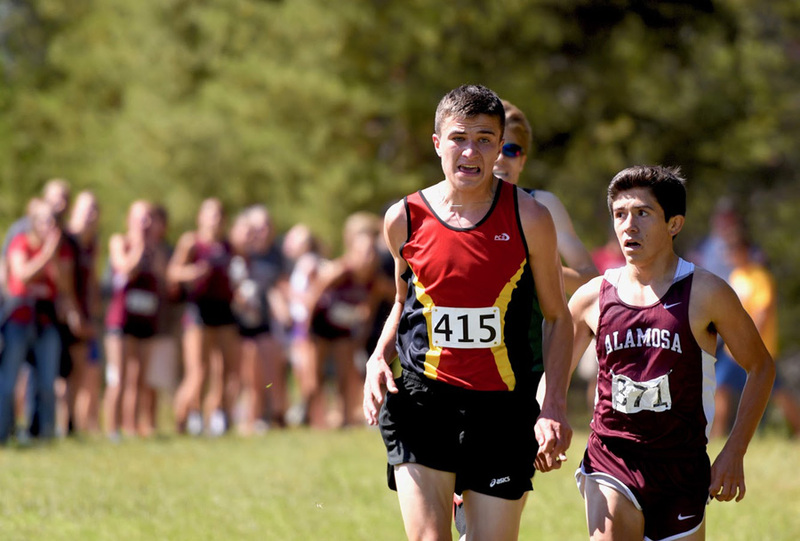 Swanson added: “When I finished, I was so tired that I didn’t even know I had won.” The boys collected all sorts of trophies up at altitude, the team placing 2nd place finishing only two points behind Alamosa High School. Catch the cross country team at their home meet, The Cougar Classic, on 9/21 down at Monument Valley Park as they take on the competition from around the area. Good luck Cougars!